Dome Valley Raceway will be holding a Test and Tune evening on April 30. The track will be open starting at 4PM for anyone interested in testing their race cars or ATV’s. For more info, contact Ernesto Juarez at 928-503-9675. The next round of NSDN’s Nostalgia series is up again with more west coast sand drag racing action from SANDRAG Magazine in 1980-1981. Thanks once again to Keith Ahart for allowing us to go through his copies and share with the sand drag community. Here are some clips and photos from the magazine’s coverage of events in Riverside, CA & Phoenix, AZ. Atoka Motorsports Park in Atoka, OK kicked off their 2011 point series season on March 12. The “Break N Luce” team walked away as the big winners on the night as Steve Smith took the Pro 1 Cars Money class win, while Marc Luce won the Pro 1 Cars Trophy class. Luce also laid down some impressive laps after installing a new blower on his Blown Alcohol Dragster, running a 3.10 & 3.06 during Test and Tune. Kevin Wilson started off the season in his sister’s “Wild One Dragster”. Russ Bailey made the haul from the Kansas City area & made some great passes with his Motorcycle-powered Buggy before parts breakage put him out. The next point series event at Atoka Motorsports Park is scheduled for April 9. Read on for full results. Pro Truck Nationals (PTN) is readying for the 2011 Season Opener at the IOK 4-Wheelers Grounds in Cleves, Ohio on May 20-21. Friday's action kicks off with an all day Test and Tune followed by eliminations in the PTN 3.5 Index, Ironman, and Pro ATV classes. These classes will go straight into eliminations at 7PM. Racers will have to take advantage of T&T for any time trial passes. Saturday's race will feature a full slate of classes, including PTN's Pro Truck & Pro Outlaw FE categories. New to PTN action in 2011 is the Quick 8 ATV program headed by Tony McWethy. The eight quickest ATV's on the grounds face off for the trophy in Pro Tree Bracket action. Alongside these classes will be the normal Bracket 1 & 2 car classes as well as a Sportsman ATV class and Junior categories. Stay tuned for more announcements on the PTN 2011 series as they become available. Read on to view the event flyer. The Las Vegas Jeep Club presented the 39th Annual Las Vegas Jeep Jamboree at the Dumont Dunes over President’s Day Weekend. Tracy Malan stole the show running a 3.48 en route to two class wins in the sand drag portion of the event. April Soares dominated the Women’s portion of the program sweeping the hill clilmb and taking three first places on the drags. This event runs a unique heads-up class system. The class breakdowns are listed below the winners. Thanks to Wendy Thompson for sending us the results from this great event. It sounds like preparations are underway to make the 40th Annual version the best one to date. Another round of NSDN Nostalgia is coming up featuring material from the Midwest. Several contributors sent in photos from different areas of this region. 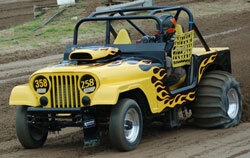 Read on to view some more great sand drag racing content from yesteryear. The first batch of photos comes to us from Mike Orness, from Iowa. Mike currently races the “Super Jeep” in Midwest & PTN series action. He sent us some coverage from Off Road magazine of Gravelrama, as well as a pair of newspaper clippings. Read on to view these. The 2nd Annual AZ vs. CA Top Fuel Shootout at Dome Valley Raceway in late January turned out to be an excellent event with nearly 200 racer entries and a massive spectator crowd. Perfect weather greeted racers and led to record breaking competition throughout the weekend. Let’s take a look at the action. Qualifying kicked off with four entries vying for the top spot at the Wellton, AZ race track. Dennis Rieck would set Low ET of qualifying session one, laying down a 2.394/145mph pass. However, in the final session, it would be the Coldwater Kid Team & driver Matt Ludlow knocking Rieck off of the top spot with a 2.392/139mph hit. 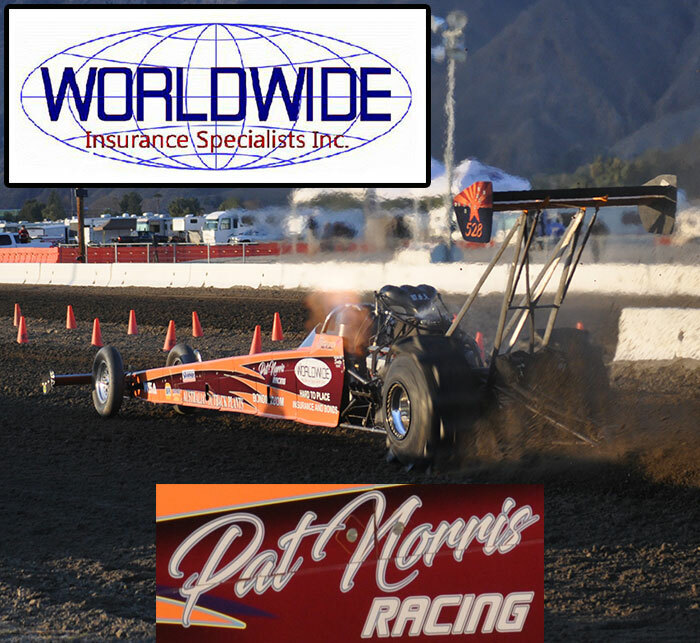 Sliding into the third spot would be the Pat Norris Racing team with driver Marcus Norris running a personal best 2.489, while Terri Blair & the Fugowie dual tire Fueler ran a 2.520 with a stellar 1.01 60’ time to round out the field. The first big race of the 2011 sand drag season is now complete, and it certainly appears this should be another great year for the sport. This event at Dome Valley Raceway saw record broken, not only on the track, but also in racer & spectator turnout at this facility. It was certainly a positive for sand drag racing in the Southwest as many racers made their first trip to Dome Valley and put on an excellent show at this premier race facility. Many racers said throughout the weekend that this was by far the nicest race surface they had ever raced on. That is saying a lot with so many top notch tracks in our sport.